Time,Time..I have all the time --: Yummy Dhudhi / Bottle Gourd Halwa or Pudding. Yummy Dhudhi / Bottle Gourd Halwa or Pudding. I always wanted to make this sweet dish, but somehow, never really got around making it. Bottle gourd is one of the earliest vegetables cultivated by man, believed to be originated in Africa. It is one of the favorite vegetables in Indian Cuisine. It grows in humid weather of India, Sri Lanka and other tropical countries. One can make lovely slightly watery dish to go with the Indian bread/Chappaties along with channa dhal (Bengal gram dhal). One can make Koftas, Kababs and and sweets out of it. It is a versatile vegetable somewhat like carrots. The various health benefits of this readily available and low priced vegetables may not be known to many Indians, yet it is loved by all Indians who find different interesting ways of cooking this vegetable and try to include it as much as possible in their daily diet. Since it very low in calories and high in fiber (100 gms. has only 12 calories), it supposed to help in weight reduction if taken on daily basis in the form of juice, which should not be strained. Bottle gourd is 96% of water, therefore is a very effective drink for weight loss. It also cures all stomach related problems, gives a healthy glow to the skin, improves hair growth, is very good for the eyes, and of course there are too many benefits to list here. One can make soups, gravy vegetable, puddings, and many easy and interesting dishes with this vegetable. So here I am sharing with you the Halwa or pudding which I made with Bottle gourd today. In a heated non stick pan I added just half tsp of ghee/ clarified butter, and fried some chopped almonds and raisins, took them off in a small plate. 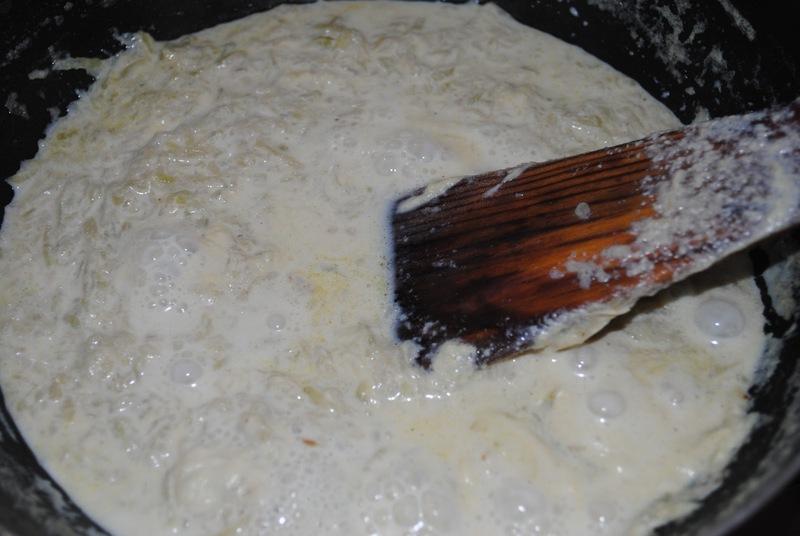 In the same pan, I fried the bottle gourd gratings for about 2/3 mins., then added 2 cups of slim milk to it. 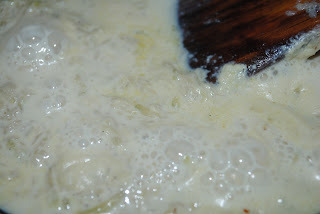 now it was time to add some sugar, not much, for I wanted to retain the sweetness of milk, just about 6 tsps . time to add the nuts, raisins, cardamom powder, a pinch of nutmeg powder, keep on stirring for a minute or so, and then remove it from the gas. This sweet dish is ready in about 15 minutes. Time to dig into this delicious fiber rich, chewy pudding with nuts to give that additional crunch, and enjoy my guilt free dessert with all my heart. Don't you feel like making it this very minute ? Rama, what a nice recipe and well explained! When I can find some bottle gourds I will try it out, thank you! I like the new photo of your house, showing more of the iron work in the nice balcony railing! I am so glad you liked the iron work, Mr. Iron Expert. 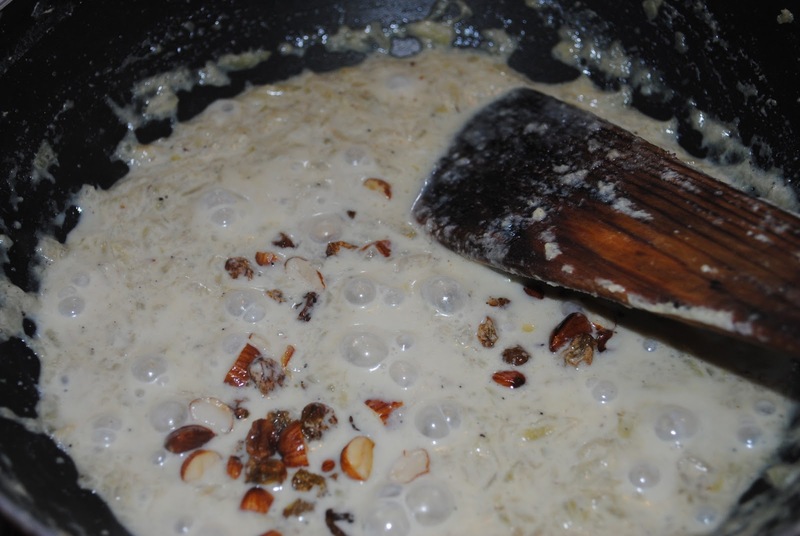 Sure you must make this very easy dessert as soon as you can lay your hands on a bottle gourd, I promise you would surely enjoy it. I am sure it must have been as delicious as it looks. I will have to visit you to have it or request you to make it when you visit Delhi. I am sure your wife must have made it a hundred times, and much better than mine. Thanks a lot for your kind words. I wish I could , Only that I have to go 30 kms to get this vegetable :-(. Thanks Shanthi. Yes try it when you get it in the market. We are laways eating lot of dudhi as vegetable,and koftas and halwa too..but this receipe sounds so easy, so must try.. Yes Renu, it is very easy, cooks quicker than carrot halwa, and taste also very good. Thanks for dropping by, hearing from you after a long time. Oh, so you too have made it, I am sure it must be tasting really good. What a coincidence we both made this dish in the same time or so. Mine didn't even last to keep it in the fridge. Maybe, because i made very little. I love lauki ki kheer. My mom used to make it often and very well. 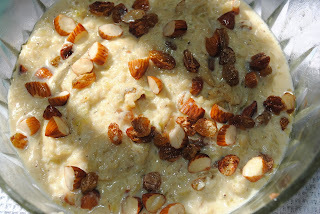 She also made a great sabudana kheer that I haven't been able to get right this far. Of course, gajar ka halwa is my favorite along with Bengali sweets. Nothing to beat mummy's recipe. I also make gaajar ka halwa in the same manner. The photos tempt me to have a spoonful.Bottle gourd is used by Keralites as a substitute of ash gourd or an additive to food. I used to drink the juice of this vegetable and it works! I make koottu out of this vegetable often. Did halwa once long back. Now will try it again! Yes the juice really helps, and once in a while it is nice to make a dessert out of it. A slight variation from the standard (Bollywood) Gajar Ki Halwa I suppose. The finished product looks inviting. 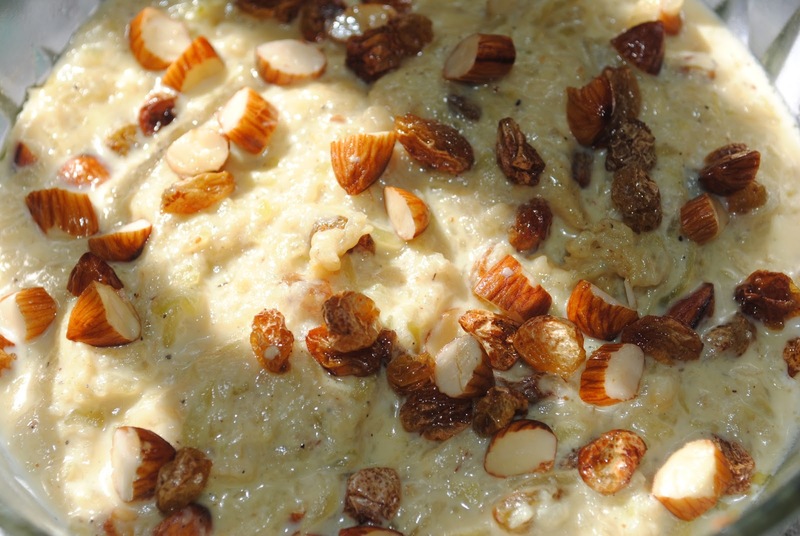 Thanks for liking the header photo, it is also my favorite.The Halwa is really easy and low in calories and if your husband loves it why not make it for him. Let me know how it comes. It comes out good, just that I use a pinch of cardamom powder for flavor and not edible camphor and sometimes cashews in place of almonds...I need to try adding pistachios though. Yes pista would definitely add the right tinge of color and flavor too. Mouth watering dish. Guilt free dish- yes. Give me some more such recipes- desserts. Rama ji..How have you been? Your Blast from the Past series was awesome..I enjoyed reading the whole series, though did not comment..This sorakkai or bottle gourd, for some reason was not included at our home while growing up..Only off-late, my MIL started buying this veggie and we make kootu out of it..This recipe is interesting..Will try out once..For a person like me, who is a hypocrite in gorging on sugary foods at restaurants , but will sparingly use it at home, do you think replacing jaggery instead of sugar will produce a result near to the yummy one that you used? Hi SM, I have only used 6 tsps of sugar for 1 and half liter of milk and 2 and half cups of grated squeezed bottle gourd. I am not sure how it will come, you see sometimes the milk curdles when jaggery is added to it, you can try, although nothing will go wrong as far as the taste is concerned. Thank you for following the story "Break From The Past", and enjoying it. Hi, Rama! I only traveled a little in Hong Kong and you changed the header?! And you put there your lovely house! I like it very much, l like sepia photos. Your recipe is yummy and the result looks good. But I still do not know what the bottle gourd is. Is this the calabash/opo squash or long melon, as I found on internet? The calabash could become halva (as in Turkish halva?)?? Very interesting! Your travels are pretty long, Adriana, and I really envy you. Thanks for liking the picture of our house, even I love sepia photos. I don't know about Turkish Halwa, but in India it is very common to make Halwas out of Carrots, Calabash, White pumpkin. Yes, it is the same, it is also known as Calabash. If you can get one in your part of the world do try this dish, you would love it. It looks lovely, should have tasted like heaven too :) What is bottleguard in tamil/telugu pls? I love lauki ka halwa. It is easy to make and tastes yum too! I dont squeeze the extra water after grating, though. actually i love these puddings after my supper and this one really looks good n easy to make.....thanks for sharing. Thanks Irfan, for dropping by. I am doing quite well. Hope to see you blogging soon. ha..ha..i don't feel like making it but i do like to eat it right away...i make dudhi halwa very same way Rama and also the carrot halwa..